Weekender: Pici Pasta Bar Pop-Up, Easter Treats and More! Weekender: La’Taste Pop-Up, Italian Renaissance, DJ Tiësto in Club Cubic and More! Win a Two-Day Pass to the Shi Fu Miz Festival 2019 in Hong Kong! A rare destination 20 years ago, today, Bilbao is on many travelers’ bucket lists. 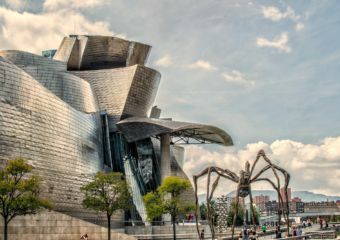 Check our list of the top 10 things to do in Bilbao before planning your trip! Macau Lifestyle is partnering up with Shi Fu Miz Festival to give away three lucky readers a spectacular two-day pass to one of the biggest music and art extravaganza in Hong Kong on May 4 and 5, 2019. Each two-day pass is worth a whopping HKD $930! Win a Pair of Tickets to Kitaro – Kojiki and The Universe 2019 in Macau! Macau Lifestyle is presenting one lucky reader the opportunity to win a pair of tickets to Kitaro – Kojiki and the Universe 2019 in Macau on April 27 at the Broadway Theatre. Easter is almost upon us and a lovely long weekend of resting and feasting awaits. We’ve scoured the city to compile a list of the best restaurants to dine and wine in Macau this Easter weekend. Excited for this month’s food delights? We sure are! Here’s a selection of where to eat this April in Macau, including seafood, Chinese cuisine and sweets! Macau is a small but immensely interesting place with plenty of things to see and do. With the many modes of transport available, getting around Macau has never been simpler. Whether you want to explore the many UNESCO World Heritage Sites in the Peninsula or spend the day at a beach in Coloane, we’ve got you covered. All you sweet tooths out there! We’ve done a round-up of where to find the best Portuguese pastries in Macau! Read on if you are looking for something different and to taste a bit of the West in the East! Sarah Ho is a locally born and bread jewelry designer that has risen to international acclaim. Find out more about her newest project, The Full Circle Collection, which is challenging, heartwarming and gorgeous all at the same time! Who doesn’t love a cake every now and then – the perfect sweet treat to perk up your mood, get you through the day or celebrate, At Grand Lapa they have a cake for every occasion. Have a read of the best from their selection – take your pick and treat yourself! Three Michelin-Starred Italian chefs, one spectacular culinary Six-Hand luncheon event at 8½ Otto e Mezzo BOMBANA Macau at Galaxy Macau! When in Macau, consider these 5 must-have applications that will make your life or stay easier. A Portuguese lady living in Macau, Ana Tique shares with you her love for dining Al Fresco by making a list of the best places where you can do so in town! Receive Macau events agenda, the hottest giveaway offers and the latest article updates!